With its snow-covered peak, Mount Hood is an American icon and a premier destination for outdoor enthusiasts. The area's mountains, forests, wildernesses and rivers, provide an abundance of recreation activities. National Geographic's Trails Illustrated map of Mount Hood Wilderness and National Forest is expertly researched and created in partnership with the U.S. Forest Service and others, to provide unparalleled detail for anyone wishing to explore this magnificent area, Coverage includes Mount Hood Wilderness, National Forest and Recreation Area; Sandy, Salmon and Zigzag Wild and Scenic Rivers; Salmon-Huckleberry and Badger Creek Wilderness Areas; Richard L. Kohnstamm Memorial Area; and Mount Hood Scenic Byway. Explore the area by following along precisely mapped trails, with mileage markers between intersections. The Pacific Crest Trail and the Oregon National Historic Trail are both highlighted. To aid in your navigation, the map includes contour lines with elevations, labeled peaks and summits, glaciers and crevasses, water features, numbered Forest Service roads and clear color-coded boundaries between areas of different land management agencies. Among the many recreation and adventure features noted are areas for camping, boat launches, canoe access, rock climbing, alpine skiing, fishing, wildlife viewing and swimming. Also included are permit, background information and safety tips for climbing Mount Hood, wilderness area descriptions and general safety information. 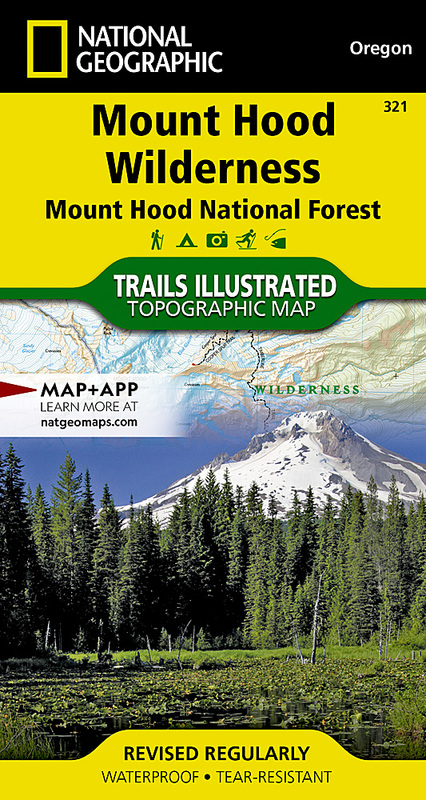 Other features found on this map include: Barlow Pass, Hunchback Mountain, Mount Hood, Mount Hood Wilderness, Mt. Hood National Forest, Salmon-Huckleberry Wilderness, Zigzag Mountain.